Tindall Corporation, a national leader in precast concrete, recently completed the precast concrete structures for Sanderson Farms, Inc.’s new poultry processing plant in Palestine, TX and has been selected to deliver precast for Sanderson’s new facility in St. Pauls, NC. Sanderson’s processing operations include feed mills, hatcheries, administrative offices and waste water treatment facilities. 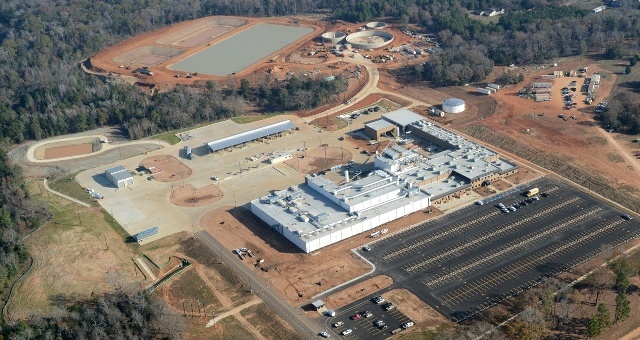 Complex food processing facilities, such as Sanderson Farms, benefit from the high-quality and multi-purpose factory-fabricated components and accelerated construction completion that precast concrete is able to provide. The high-performance, insulated architectural wall panels provide the exterior visual features of the facility and the insulated and energy-efficient thermal building envelope for the varied interior room environments, ranging from refrigerated to ambient. The interior smooth surfaces are necessary in certain processing areas where clean design features support food safety and hygiene that are critical to the overall facility operations and good manufacturing practices.